Screenshot of the homepage of The World’s Most Exclusive Website. Photo by Marc Sullivan. Most of the people reading this won’t be able to visit more than the homepage of The World’s Most Exclusive Website. The site is a project by Jeff Greenspan, Doug Loffredo, Mike Lacher and Chris Baker. 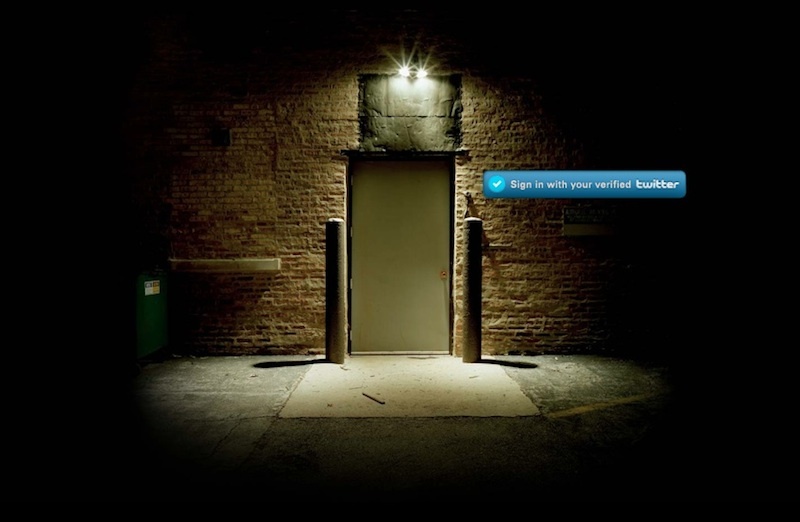 To get in past the homepage (which features a photo of a door in an alley), you have to sign in with Twitter, authorizing a The Most Exclusive Website app to access details about your account. To get past the homepage, the app checks to see that you have a verified Twitter account, which is the kind of account you get when Twitter approaches you and says, “We want to make sure that you’re who you say you are, because you’re important and people are going to try to fake being you on Twitter.” The next page on the site is just another photo of a door, this time in a room. To get past that page, the app checks that you have a few thousand Twitter followers. The next page is another room with a door. To progress further you need more followers, and so on and so on… There are 9 rooms in total. Nobody has made it to the last room yet, but a lot of people have tried. According to Buzzfeed, the site racked up 25,000 page views in its first eight hours online. Some of that was because the site is the sort of thing you just have to share with friends just like any other URL-specific artwork prone to go viral, but for the first few hours the site had an added tool: auto-tweets. So at least when the site was first online, The World’s Most Exclusive Website was almost definitely tweeting out its existence from accounts of people who did not intend to tell their followers about the site. While the site was being promoted along the same streams that any other viral content might go through on Twitter, it got there by inserting itself rather than being shared freely. I don’t think that’s a bad thing, although I can understand why some people might have been upset and why Twitter disabled that functionality of the app. With the auto-tweeting function removed, the site was neutered into simply a popular URL-specific artwork and not organic or invasive viral art. The World’s Most Exclusive Website is an interesting example of invasive viral art because it still requires a click. As Greenspan points out, you have some idea of what you’re getting and you’re making the conscious choice to see something. Most invasive viral art infiltrates by inserting the work itself directly into an environment, but The World’s Most Exclusive website infiltrated by inserting a link to the work into a stream of shared content. Despite users having some vague inkling of what they were going to get, the site did have an element of surprise. That’s the funny thing about putting street art online, especially on street art blogs. It loses that element of surprise. Greenspan thinks his projects like The World’s Most Exclusive Website and The Likeable Constitution fall somewhere between the surprise of coming across street art on your commute to work and the lack of surprise of checking a street art blog. He says, “Things like The World’s Most Exclusive Website have a bit more of that element of surprise. When I go to a blog that is showcasing street art, I expect to see street art. When I go to something like Boing Boing, I know that it is a set of images and ideas that have been curated for my tastes. Whereas with The World’s Most Exclusive Website, somebody may have sent you there, but you don’t really know what you’re going to get. A project like The World’s Most Exclusive Website or The Likeable Constitution actually lets you walk through it like a physical space and then experience the surprise of it. But I don’t think it’s quite the same because I’ve chosen to go to Thelikeableconstitution.com. I’ve chosen to get something. When I walk around the corner from 3rd Street to Avenue A, I don’t expect to be confronted with something that’s going to challenge my very nature of being in that space.” Greenspan makes both organic viral art and invasive viral art, but, whatever form it exists in, I think many of his digital works exist on the internet in a very similar way to how street art exists on the street.